2010 Astronomi-con Vancouver is Over! I didn’t win best overall, I did win my first game scoring 12 points which was quite impressive. Maybe this gave me delusions of grandeur. What it did was put me at the top of the table so I had to play the really tough armies and generals. I drew Nick Daniels who promptly stomped me. Though I did do better than our previous game, at Mini Astro Van. I got into H2H with my Landraider of Pain and routed much of the Imperial centre. 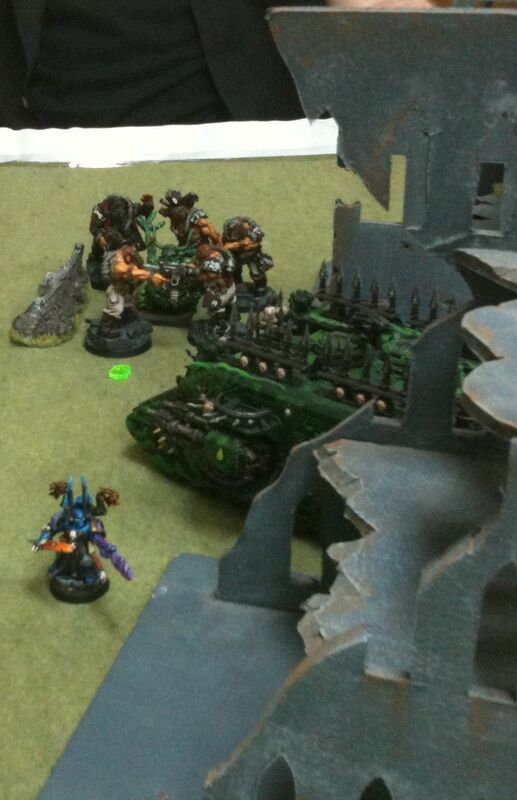 Then the Ogryns arrived and proceeded to beat up or route my three Chaos HQ choices. My lascanons totally let me down utterly failing to damage the Leman Russes or even the flyers/skimmers when they arrived. I got well and truly melted by the melta gun veterans too, but I’m getting ahead of myself. This year’s Astro Vancouver was a big success by all measurements. Nick Daniels won Best Overall. Lee won Best General with his Orks. I finished third for Best Appearence for the second or third time at Astro, but you won’t hear any complaints form me. There were a lot of tiebreakers involved so some people won unexpected trophies, they weren’t so much upsets but a product of the Astro policy of you can only win one trophy. Plus the trophies are ranked from Best Overall down to perhaps terrain, Best Terrain was probably the least contested trophy at this year’s Astro Vancouver with only two official entries. 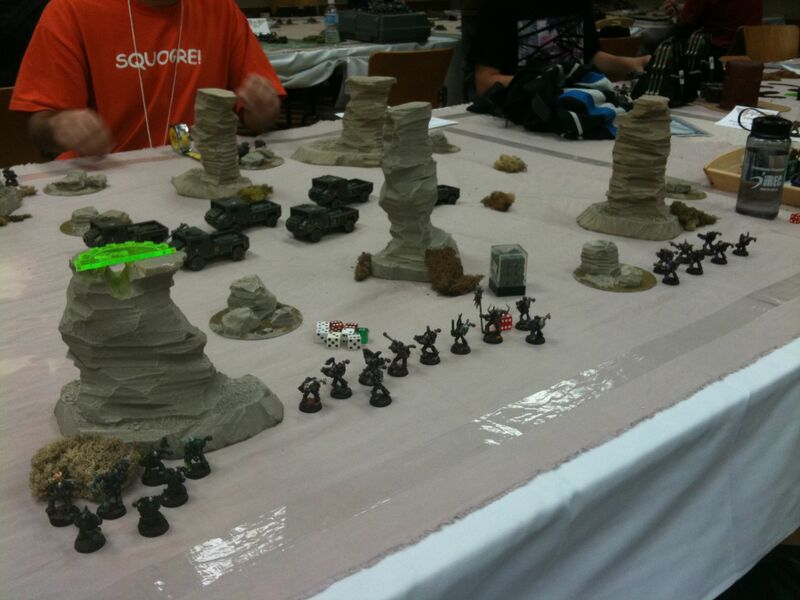 Next year there should be more Best Terrain entries. 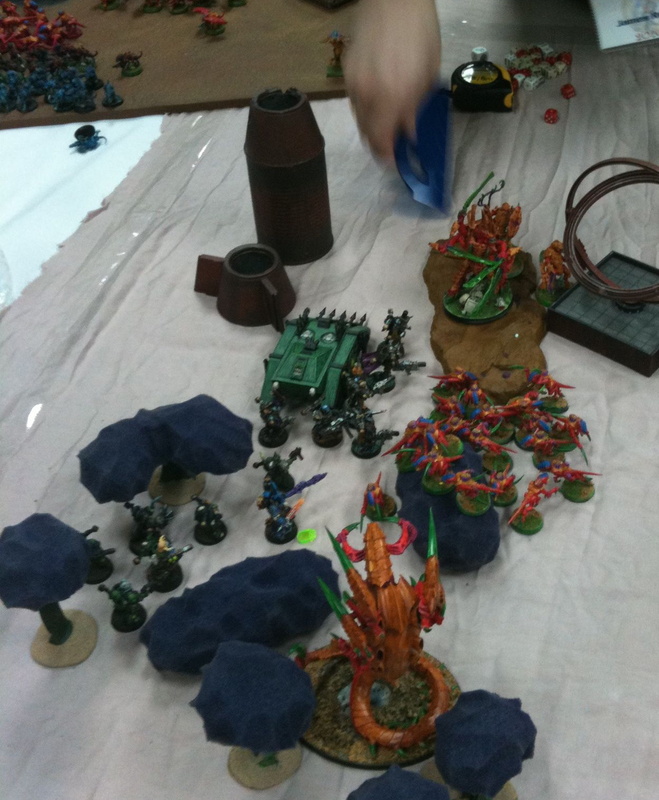 This year’s Best Terrain entry went to Duke who also helps out a lot behind the scenes making Astro Vancouver happen. I’ve forgotten the name of the guy who one Best Army List, um Steve… Franks according to the official results. He is another Vancouverite, this year the Americans didn’t take home all the best trophies and prizes. Though Nick thanked at least on American for not coming. Best Mini went to Matt Lau which was a bit of surprise. I liked his army and obviously the best model in it was well painted but I suspect Marshall Reeves got a lot of votes here, he got mine. 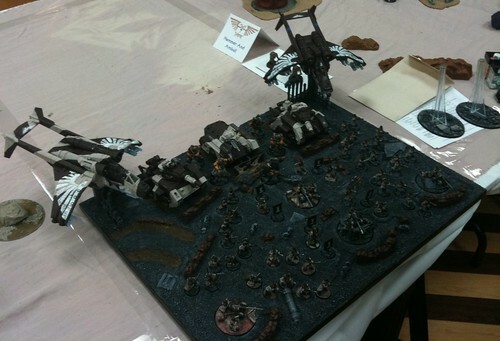 I’m not sure of all the tie breakers but tournament attendees get to vote for favorite army and best single mini. I didn’t finish in the top three for either of these categories. I think bringing the Diseased Sons or at least Chaos Space Marines three years in a row hurts me some, but I thought my Khorne Lord might have been a contender… It was a converted Forgeworld model which don’t see very often. An Avatar of Khaine won best single mini, frickin’ Eldar. Best Army which is strictly chosen by the players, went to Marshall. He must have ranked well if not winning some of the other trophies but this was deemed more prestigious as it is peer chosen. So it was good all his effort was rewarded with a fancy trophy. Even better news for Marshall came later when he finished second over all earning the much coveted, by some, invite to the official Games Workshop, North American Grand Tournament in Las Vegas next year. So Marshall and Nick will be flying the Astro flag or wearing the Astro shirts in addition to their club shirts at Vegas next year, good luck guys. So how did I do, I’m not sure overall, but I did better than last year, which is what matters. Here is a mini batrep for each of the six games I played at Astronomi-con Vancouver this year. 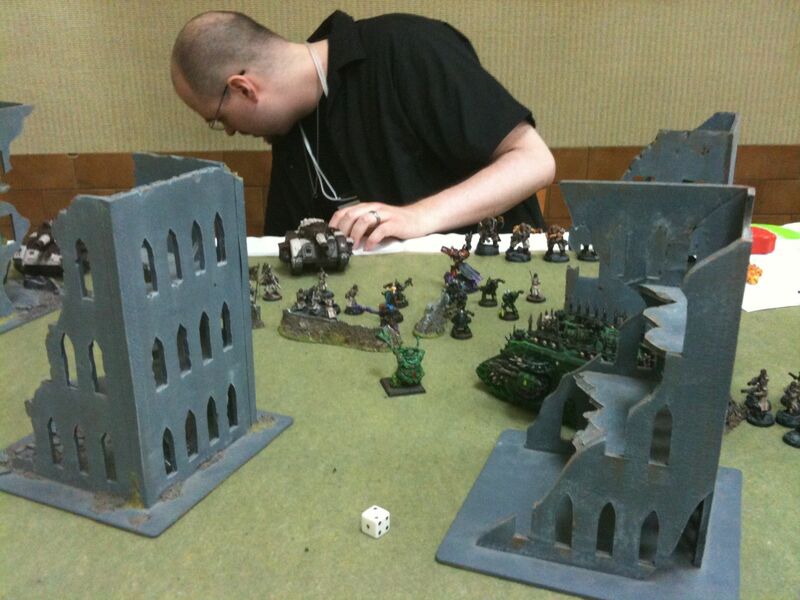 My first game was against Ryan and the Imperial Guard army he apparently borrowed as his wasn’t quite ready in time. I think I benefited a bit from his unfamiliarity with the army, but I’m usually unfamiliar with mine and I got very little sleep prior to Astronomi-con as usual, so things were pretty even. Lost Patrol is a mission where both players have one troop choice that starts on the opposite side of the board and needs to make it to the other side alive. Unfortunately you can’t actually escape off the end of the board you have to hunker down and wait for the game to end. We both put footsloggers on the board, me because all my troops were on foot officially and Ryan seemed to think his Veterans were versatile enough to adapt to whatever faced them. Reserve rolls can be crucial at Astro, I’ve lost games because literally half my army either never showed up at all or didn’t show up until after the enemy had completed his mission. I think I may have been a bit luckier than Ryan at Reserve rolls but I wasn’t lucky, lucky. I’m never lucky at rolling dice. George showed up early and possessed Clamitius. He then ran towards the Imperial guard forces trying to kill the Lost Patrol which consisted of an Infantry squad and a Leman Russ Punisher. Ryan stopped shooting at my Lost Patrol to try and kill George which he ultimately accomplished but I was a bit surprised, as completing the mission is of the utmost at Astro. 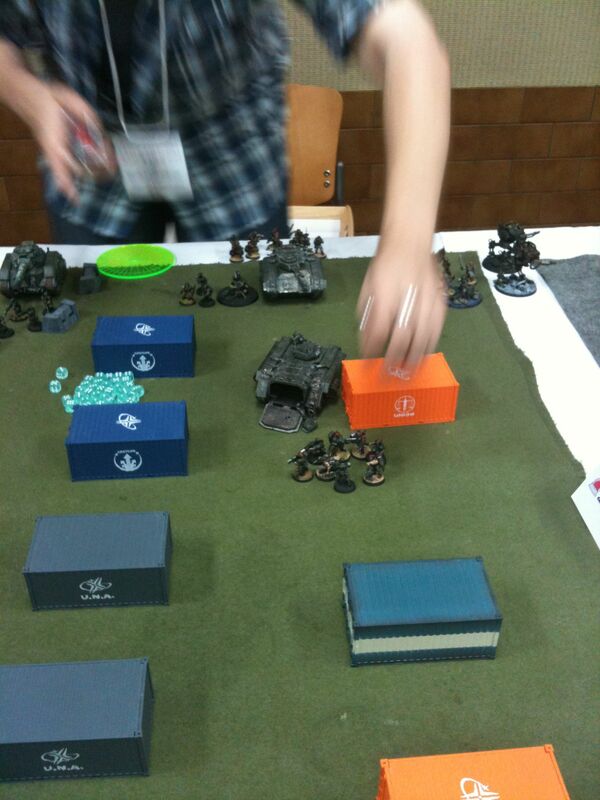 Ryan also had some Scout Sentinels outflank between the Lost Patrol and my table edge at some point. 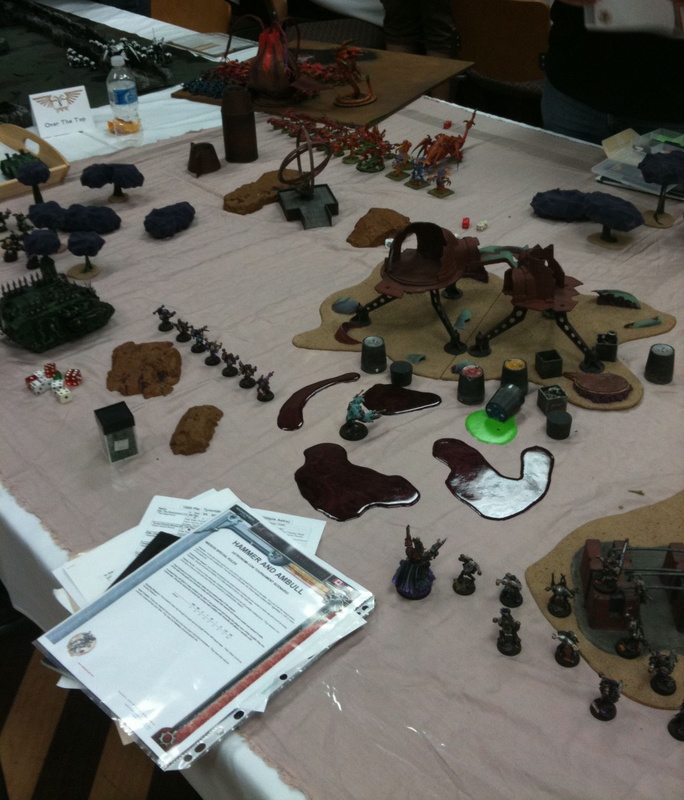 I had my Khorne Lord and the Obliterator on that side. Hunting down his Lost Patrol were the foot slogging Nefarious Fire and eventually much more effectively the Chosen in their rhino. I charged the Scout Sentinels with the Lost Patrol after killing one with shooting. I used my Krak grenades to destroy the other and advance eight crucial inches up the board. 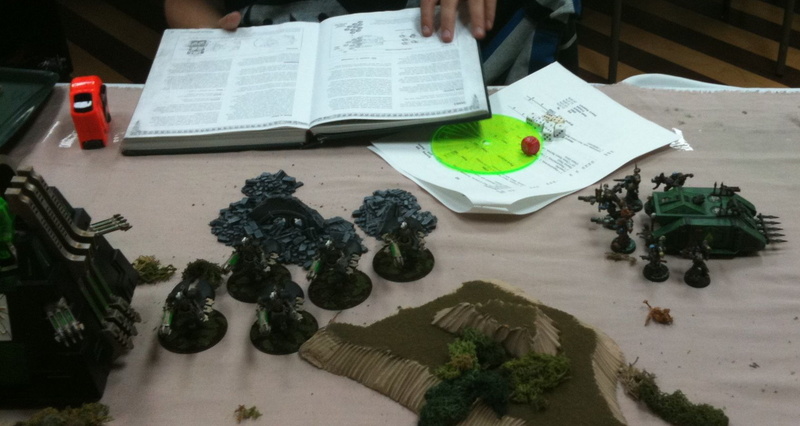 Ryan advanced the Punisher and another squad of Guard in a Chimera. He killed my Obliterator at some point. 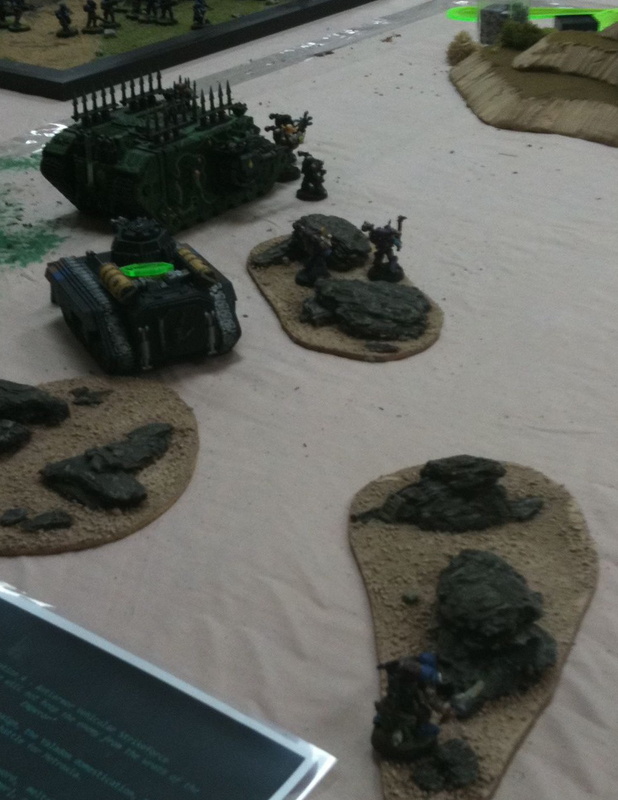 While all this was going on, the other Leman Russ, a Vanquisher, was shooting at my Landraider which was shooting back. He repeatedly missed or failed to penetrate my armour value 14. I concentrated on using cover and getting over to where my Lost Patrol was to protect and shield it. My Chosen caught up to his Lost Patrol on foot just before they could get into the Chimera he had driven empty towards them. 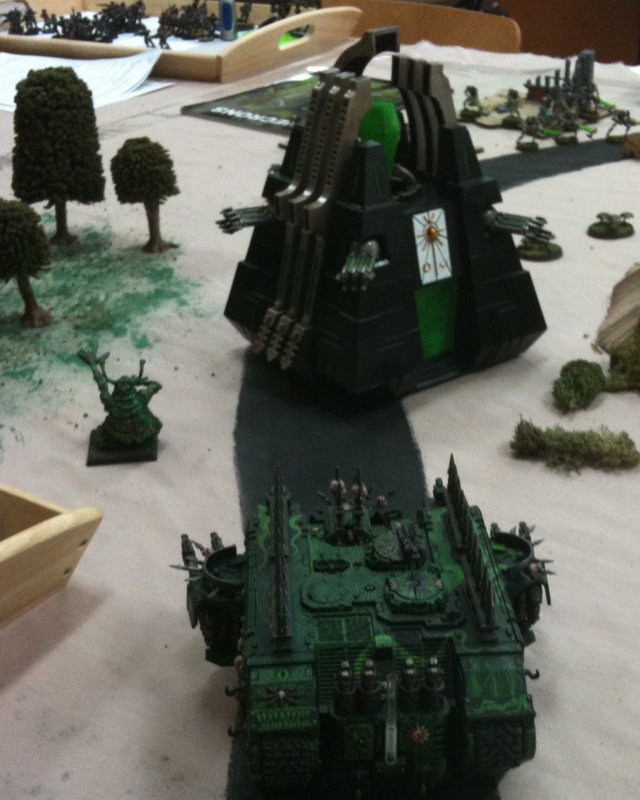 I used my combi-weapons and what not to kill all but one Imperial Guardsmen. He escaped and the Chosen fought a different Imperial Guard Squad instead next turn as they got in the way. My Lord hooked up with my Lost Patrol and acted as a human shield to a degree. The Lost Patrol headed away from the Punisher with the Landraider eventually killing it perhaps. Then the game ended and I got 300 extra Victory Points for getting my Lost Patrol to my side of the board. This mattered as it turned a probable tie into a victory and I picked up two secondary objectives scoring 12 big points! This was perhaps my best Astro result ever and certainly my best start. Then it was lunch time. So as already mentioned I lost to Nick Daniels and using those easy 13 points he went on to win Best Overall. Once in Ottawa someone got mad as they lost a tournament of Silent Death because the other guy drew me in the semi-finals and I was considered too easy of a victory, giving up too many points or whatever… I try to win. I just don’t try as hard as some people. I lost to Nick because I couldn’t deal with his Vendetta or more specifically the Veterans inside his flying transports with all the Melta Guns. In future I think the solution is to stay in your transports until the veterans are on the table top. Little known fact, you can shoot a melta gun out of rhino, so it isn’t like I absolutely have to get out at the first opportunity. In the olden days Rhinos were a bit of a death trap, no more especially for Fearless troops like Plaguemarines. We won’t go in to details on the ineffectualness of my Lascannons. I still could have won as I concentrated on getting my Landraider of Pain across the board and my Lord into H2H. I proceeded to kill or route all the guardsmen I could. Then the Ogryns arrived and shot up and charged my HQ and retinue. Even George had no luck against them. Literally no luck. My sorcerer isn’t Fearless and ran after the Ogryns won the first round of H2H. Neither him nor the Lord were really wounded… I still had my powerfist champion too I believe. I didn’t get too hurt at all in H2H early on. Next round of H2H my Lord didn’t get to even go as he rolled three ones out of seven dice as Nick concentrated on killing him and I dutifully failed just enough armor saves to die. That said I liked having terminator armour, I’m not sure I’ll run a terminator lord again, but some Khorne or Undivided Terminators will be definitely painted up. With my Lord dead and most of Gangrene Squad, George showed up and had to fight alone against the Ogryns. I might have ended up killing an Ogryn or maybe two but in general I got stomped in H2H by Imperial Guard Ogryns. Truck Convoy is a fun mission and wasn’t Victory Points based. I try hard to accomplish the mission, so Victory Points games are not to my favour, but I had two so far. For the longest time it looked like we would tie with two canisters each. Then he transferred his canisters from his jump pack armed guys to his tactical squad guys after I said he could totally do that. Then the jump pack guys jumped into the fray around my second canister. I got my first canister with George and though we were a bit confused at first this wasn’t a bad strategy as basically he carried it away while the Loyalists shot as much as they could at him. I put my chosen in front of the truck convoy but I think that was a mistake. The trucks move randomly and perhaps I should have used the Chosen more aggressively to take the fight to the enemy, that was Otto’s post-game suggestion. What ended up happening is we disabled two trucks, destroyed two trucks and their canister, and severely damaged two trucks. Two trucks were on his side and two were in the middle close enough for me to walk to. George eventually died and the Obliterator couldn’t pick up the canister so Syphilis had to grab it. I spent a lot of effort, way too much effort trying to kill the Baal Predator with it’s four re-rolling shots a turn. He also had a bunch of razorbacks with heavy bolters shooting at George. My Landraider missed or failed to destroy the Baal Predator too many times and then due to all the carnage couldn’t do much the rest of the game. I should have deployed it more centrally. Things arrived from reserves that weren’t on foot, only footsloggers could start the game on the board. So there are advantages to being on foot in some missions. 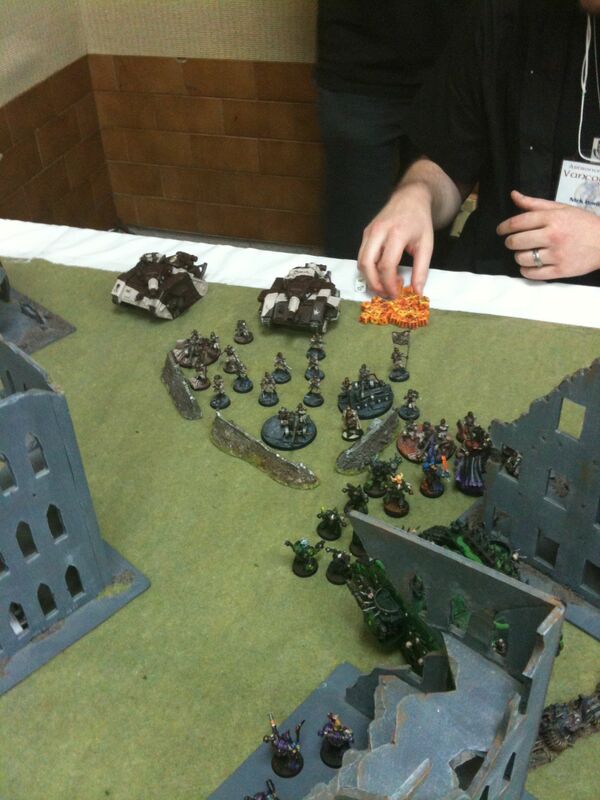 Gangrene got my second canister and then were charged by a Sanguinary Priest and friends. Sanguinary Priests are annoying and cheap at 50 points and my opponent had three of them. My Lord got rid of one maybe even two. But Gangrene had to drop the canister and was gradually killed off. The Nefarious Fire ran up saved the Lord from being dragged down by weight of numbers, but even if the canister is at your feet you can only pick it up at the end of your movement phase, not during consolidation. So I had to stand where I was and wait for more Blood Angels to attack. More shots were also sent towards this canister as the game went on. Eventually it became clear that even going to seven turns I would never be allowed to pick up the canister even if I killed every Blood Angel that came near. 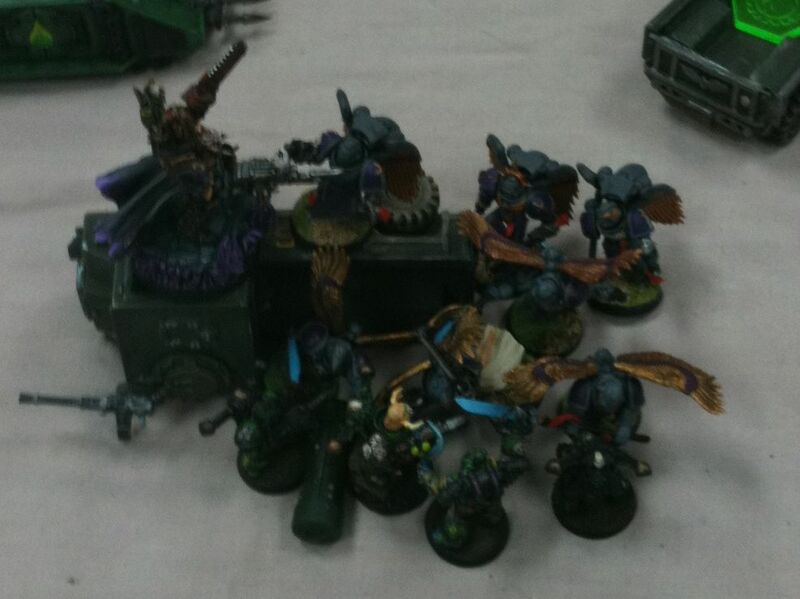 So my Lord actually left guarding the canister and tried to kill tactical marines with his combi-bolter. There were only five tactical marines holding two canisters, but they were behind ruined rhinos, trucks, and all sorts of other stuff so my army on the right most importantly the Landraider couldn’t get a bead on them. The game ended and I lost 1 canister to 2. I forget how many points I had but not many, maybe 4 for my efforts giving me about 18 after day one. Very middle of the road if not in the bottom half. After the traditional pub diner I went home uploaded photos to Flickr and fell asleep. James gave me a ride home and to the tournament so it was odd we drew each other. I lost this game, which was once again Victory Points based and the reason I lost, besides the fact that George, the Khorne Lord, and Sorcerer proved no match for the Tyranids in H2H, was deployment. I won the roll and chose to stay on the side I was on and go first. I thought this would give me an extra turn to shoot at the Tyranids. I deployed across the width of the board, put the Sorcerer with Gangrene on the left flank the Khorne Lord with the Nefarious Fire on the right flank so as his outflankers and deep strikers would have to fight one of them. He chose to refuse flank and set up most of his army in the far left third of the board. The Ambuls we played a bit wrong and they had no real effect on the game. He kept giving Feel No Pain to his 24 strong unit of Hormaguants and they were in cover on the one turn I got to shoot at them. I killed one or two. 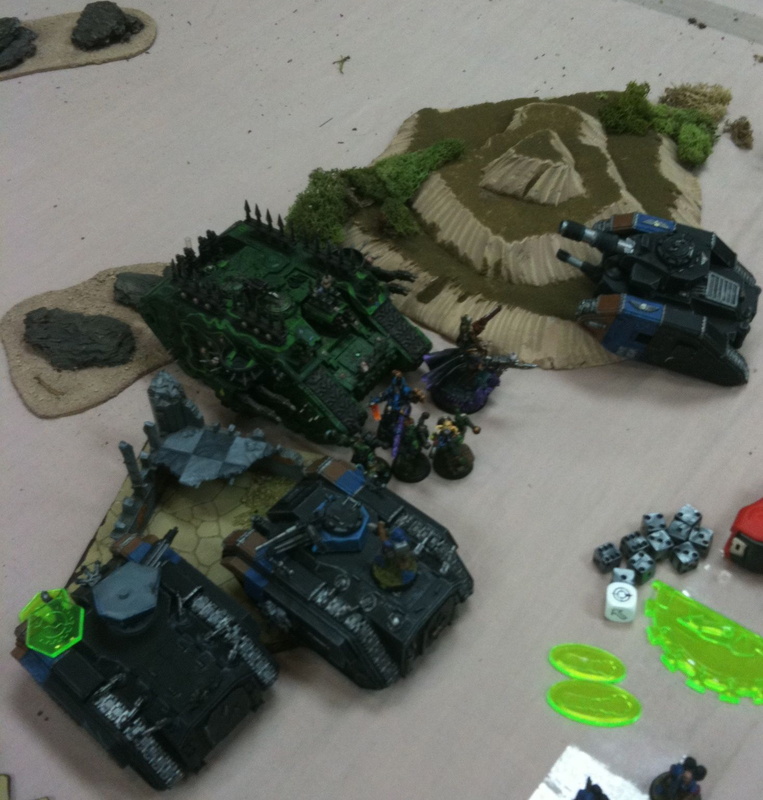 The Landraider and the Obliterator concentrated their Lascanons on the easier to kill big bug, the Tervigon. I ultimately killed it but it was too late, it made the Hormaguants game winners who along with the Swarmlord and the Trygon Prime I had no real good solution for. His Gargoyle’s died while deep striking and my outflanking Chosen majorly whiffed. They arrived got out and blasted the Hormaguants missing with three of the combi-meltas and failing to wound with the fourth. Next year I won’t have four combi-meltas. I still like Chosen but the combi-meltas in the Rhino was not an improvement. I think I’d rather be on foot so I have the option of Infiltrating or Outflanking. Anyway the Sorcerer was a total failure, failing to cast his spell and causing himself a wound. I think I even shot the Landraider at the Hormaguants. They got to charge Gangrene and and even the arrival of George for the Chosen Champion didn’t do much. James complained that I died too slow, but the fact I was going to die was inevitable. My centre also fell with the Zoanthropes getting in range of the Landraider and promptly destroying it. I should have shot at them more I guess. But the Feel No Pain was really making a difference so I concentrated on the Tervigon which meant the Zoanthropes got to make it in range. I killed one early on but then the giant Mycetic Spore and the Termagant Brood drew my attention. 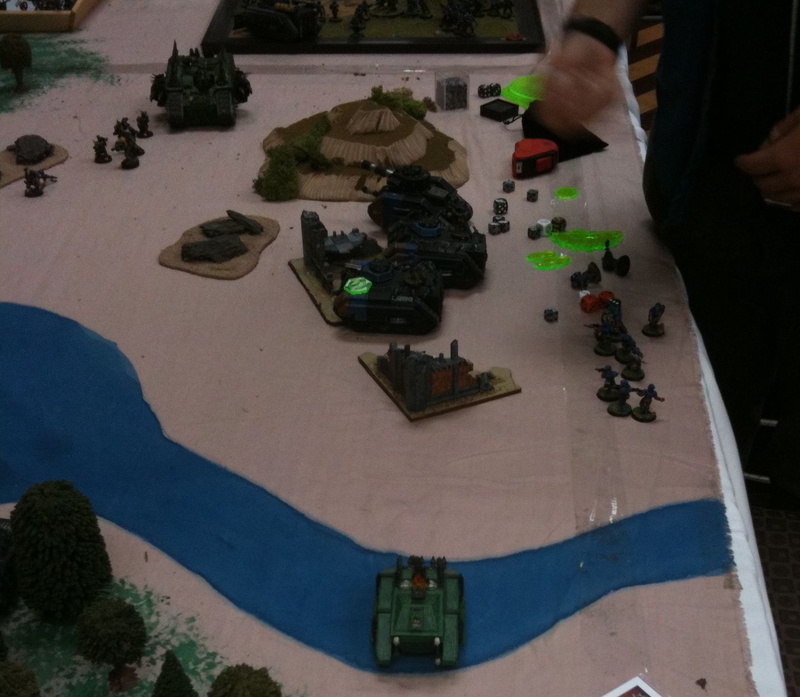 I eventually killed both, but by then I’d lost the left flank and my Land Raider. 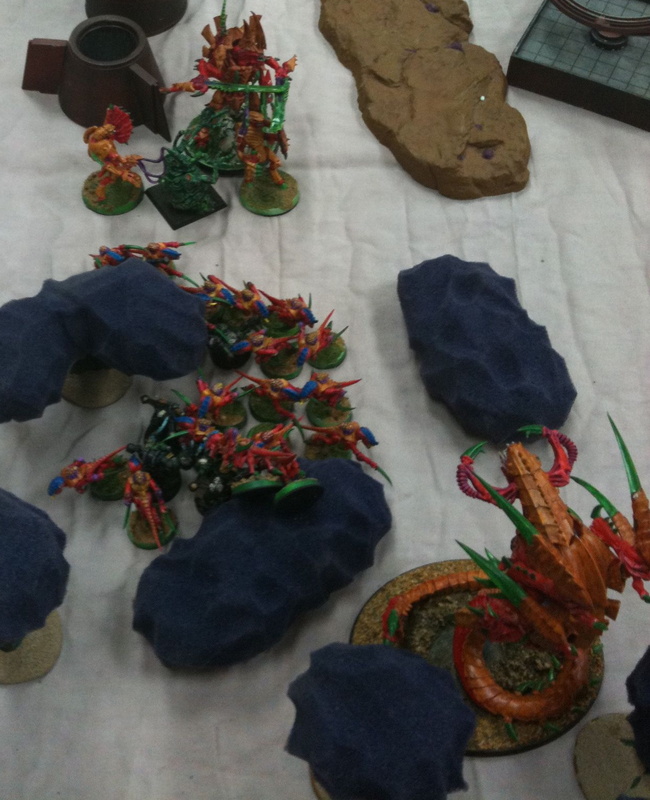 My Obliterator was next to go as the Tervigon ate it. I almost killed the Tervigon got it down to one wound remaining. It should have died as the Nefarious Fire poured fire into it. But then it spawned more Termagants. Eventually the Nids got into H2H with my right flank and the Trygon Prime was too much for the Khorne Lord. I actually concentrated on killing the little bugs as I knew I was going to lose H2H with the big bug and I’d get an extra point if I killed all his troop choices. 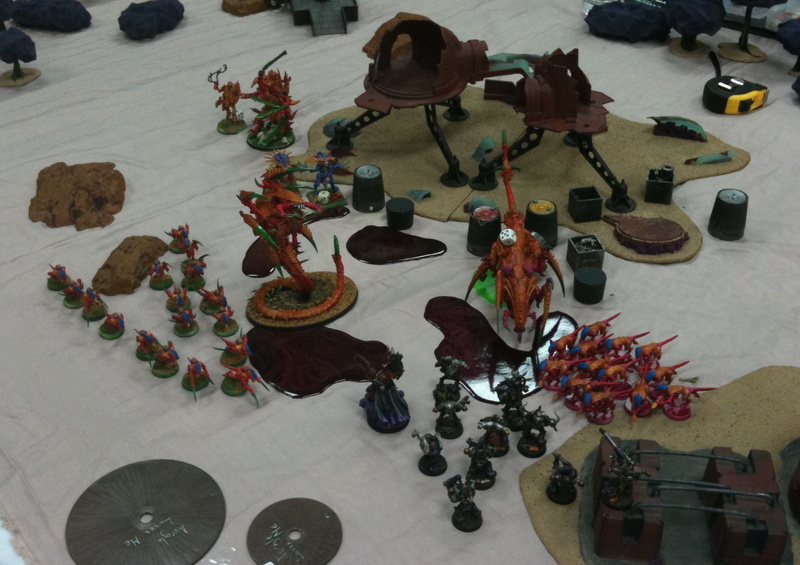 James was unable to kill all my Nefarious Fire Chaos Space Marines before the game ended. In future against the Nids I will either castle in a corner or set up my entire army in the middle. Of course my future armies will be a lot different but I still favour H2H over shooting as generally Chaos is not the shootiest army around. 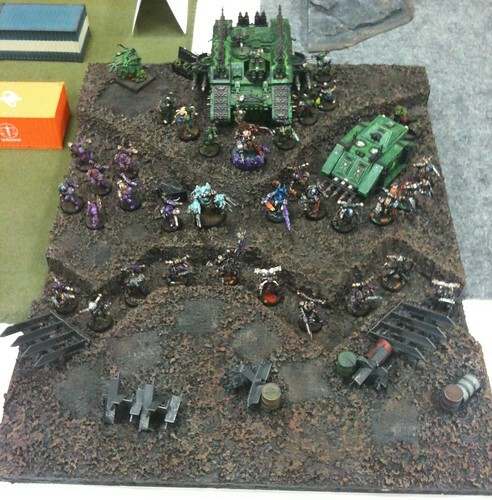 If you hadn’t guess it yet, Imperial Guard was the most popular army this year at Astro. I counted seven or so. Even putting all the loyalists marines together they didn’t have as many and I was the only Chaos Codex user and brought the only Daemon. 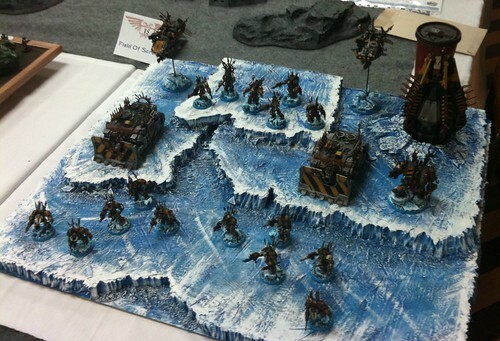 There were no Daemon armies, no Sisters, no Space Wolves, but every other army was represented. Devon’s Imperial Guard was different than Nick’s or Ryan’s but like Nick he had two flyers, one Vendetta and one Valkyrie I’ve been informed. His troops were all Veteran squads either in Chimeras or Vendettas. He had two special characters, Marbo and one of the super Sargents. 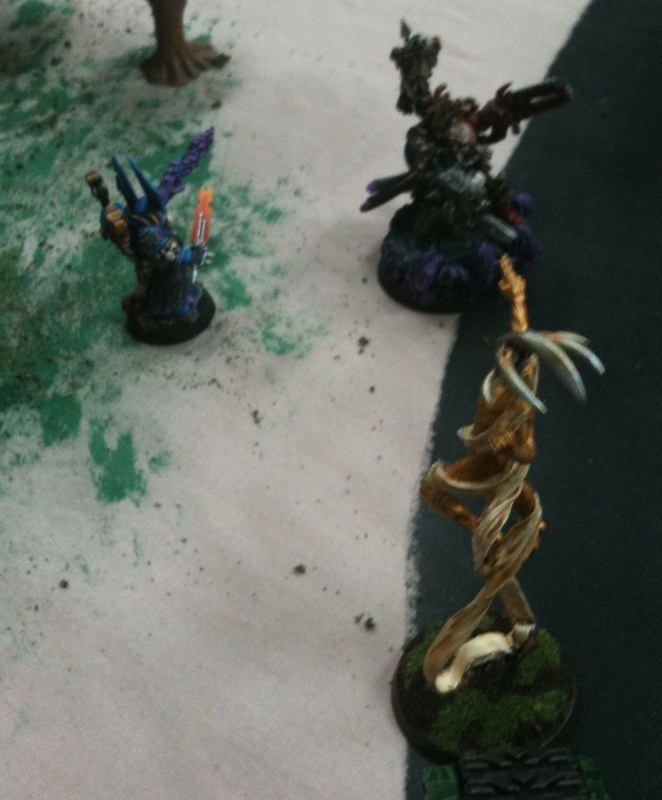 Marbo appeared in my backfield threw his demo charge and killed four or five plaguemarines. Then I moved away from him and ignored him until he charged me. Devon also dropped off a Veteran squad in front of my Landraider filled with Pain. They of course rolled double ones for their charge roll through the rocks and never got to use their melta bombs or whatever on the Landraider. I shot at them a lot but they went to ground and survived. This was on the left Flank, on the Right Flank and the other side of the river things were going better for Devon. The other flying transport plus the Leman Russ killed the Nefarious Fire squad quite rapidly even though they were in cover. The final model actually ran off the table. This mission was table quarters and I knew I could never take all four but the plan was to hold the Right Flank with the Nefarious Fire and the Left Flank with Syphilis while advancing in the Landraider of Pain into the Imperial ranks. 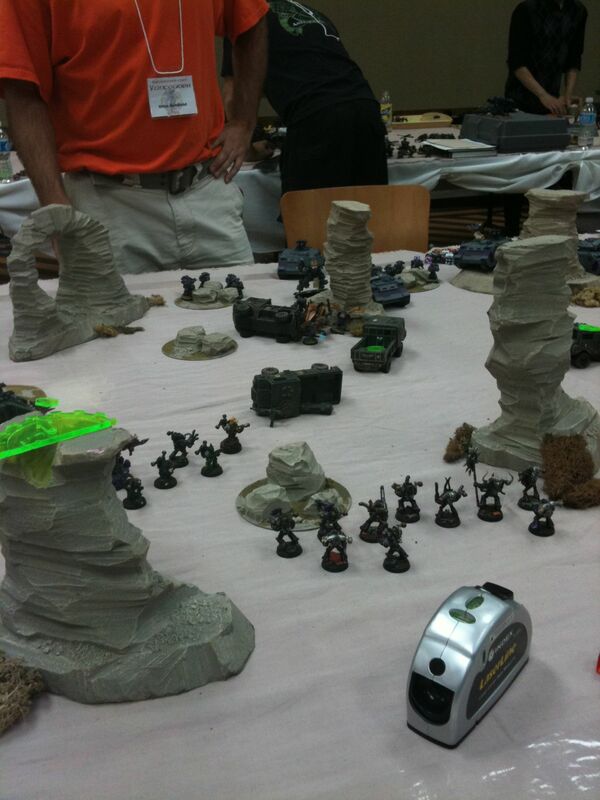 Marbo and the super aggressive veterans and of course the Vendetta and Valkyrie gave me problems. Eventually Syphilis charged his Veterans. Devon also had a Bane Wolf which I tried to kill before it reached my lines but all I could do was shake it or something. When I realized all the melta bombs and another demo charge were on my doorstep I made killing those Veterans the priority. Syphilis came through. 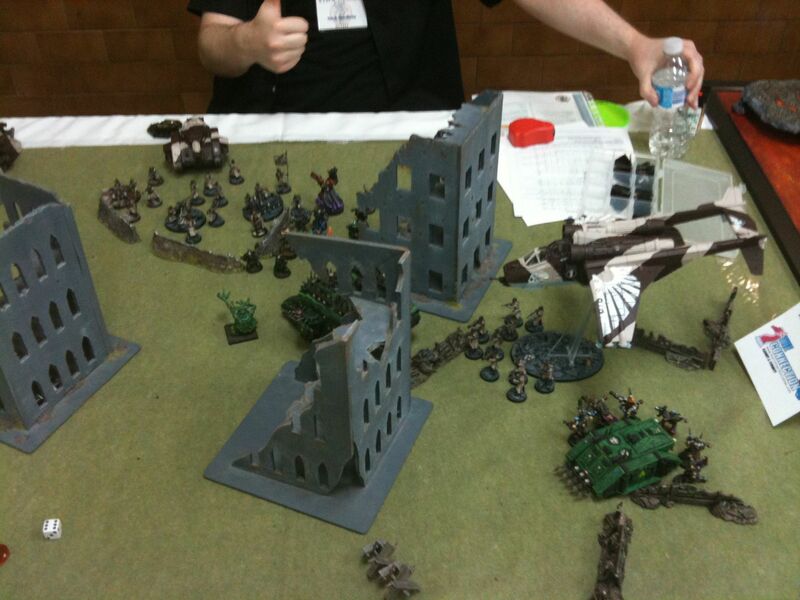 I roared the Landraider forward disembarked Gangrene and melted the Vendetta with point blank fire. This is the way to get rid of Vendettas. Stay in your transport and drive right at them. Make em run or die. 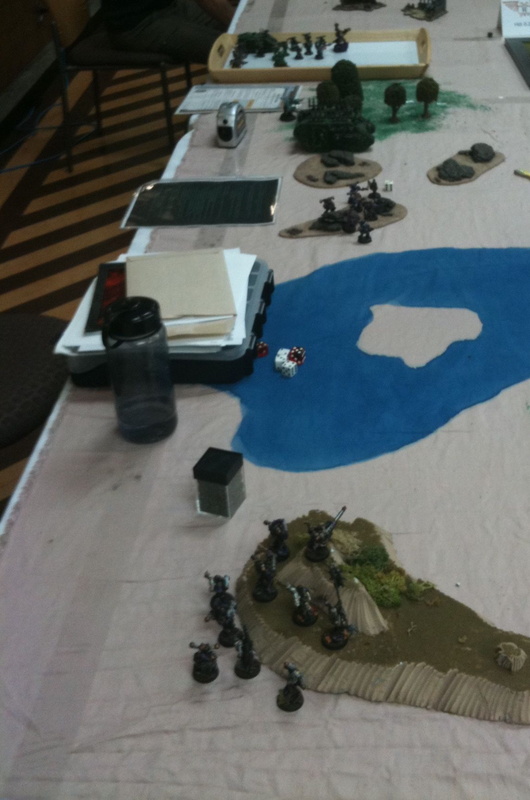 My Chosen showed up at some point on the far flank and had to drive through the river. Devon shot them a pile, but with the Lascannon Vendetta dead he had to use Chimeras. A couple of his Chimeras got stuck moving through difficult terrain which was nice, but still there was four tanks in cover I had to deal with. I totally lost my right table quarter and eventually abandoned my left one after melting the Balewolf and beating down Marbo. I got back in the Landraider and drove towards the enemy. Occasionally I’d shoot at the Leman Russ or it would shoot at me, but eventually it retreated. He couldn’t stop the Rhino and the Landraider was too much for him. The Chosen got out and roasted one Chimera. George showed up too. The Chosen took a beating in return fire but the lone survivor and George killed the Imperial Guard opposing them in H2H next turn. I split up Gangrene and my Lord. The Khorne Lord went and knocked on the Leman Russ while the rest of the Landraider of Pain dealt with another Chimera. I didn’t succeed in killing the Leman Russ the first round, but I immobilized it which was almost as good. The Chimeras and Guardsmen were no match for the Plaguemarines and the Sorcerer. George ran into the far right quarter and I drove the rhino there too. 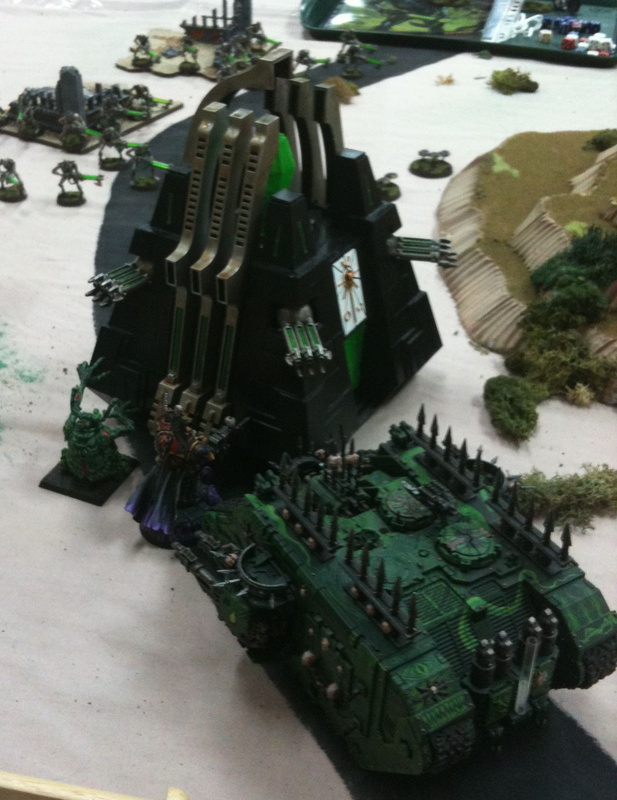 After killing the Leman Russ the Lord got back into the Landraider and drove into my home quarter. In the last turn I even shot down the other flyer with a Lascanon. The game ended and I won two table quarters to one, with one being contested. 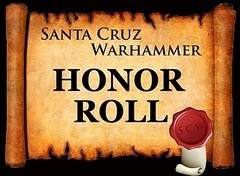 This along with my hard work crossing the table and killing off other stuff of his earned me 13, full points. 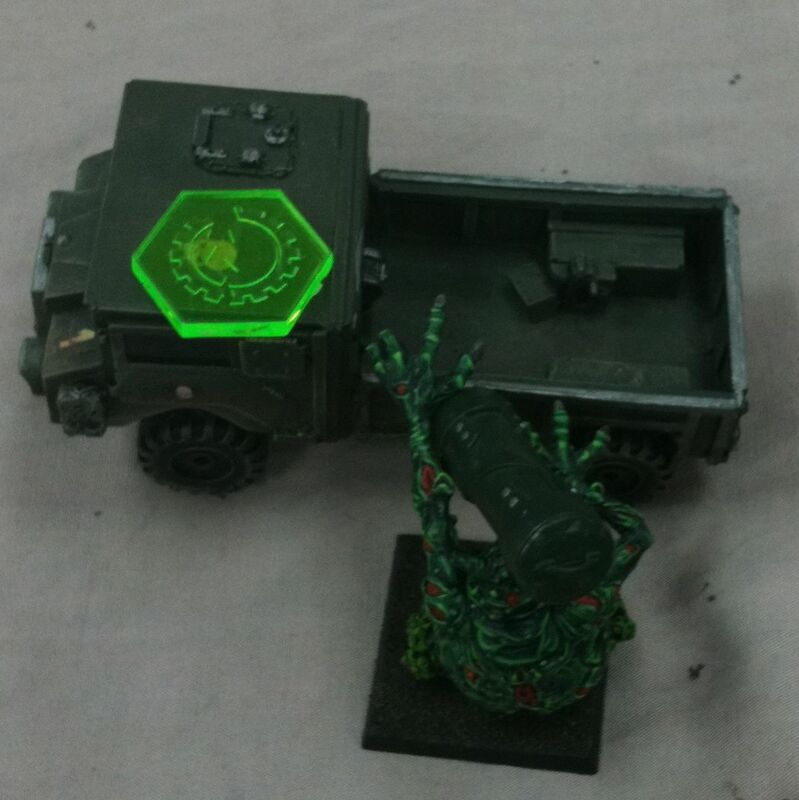 The plan was to drive down the road with the Landraider and kill the necrons and let them warp out. I didn’t plan to put much effort into killing the pylons or the god. It was a good plan made better when one Pyramid immobilized itself scouting of all things. The C’Tan started over the hill and the Landraider got on the road. Unfortunately the second Pyramid blocked the road so I decided to ram it. I knew they were hard to kill, but just how hard… Lascannons, Chainfists, Monsterous Creatures, even Melta Guns at point blank couldn’t scratch it. The living metal rule taking away the second dice of penetration is harsh. My best hope was the Chainfist Lord but he kept moving the Pyramid a half inch. Meanwhile the C’Tan killed Syphilis, they tried to shoot him, and five point blank plasma shots all hitting ultimately did nothing. The Destroyers killed the Nefarious Fire pretty much. The Chosen and George arrived. I actually possessed Bob the Necessary Evil because I though George might be able to hurt the Pyramid. Alas he couldn’t at all despite being a Greater Daemon as he only had Strength six! I shouldn’t have even tried to kill the Pyramid, I should have risked the difficult terrain test and drove through the forest. However it was very much in my way. I was going to get back into the landraider after two, no three turns of futility but then the giant blast of the Pyramid immobilized my tank. This ruined whatever hope I had of winning. The sorcerer finally got out. 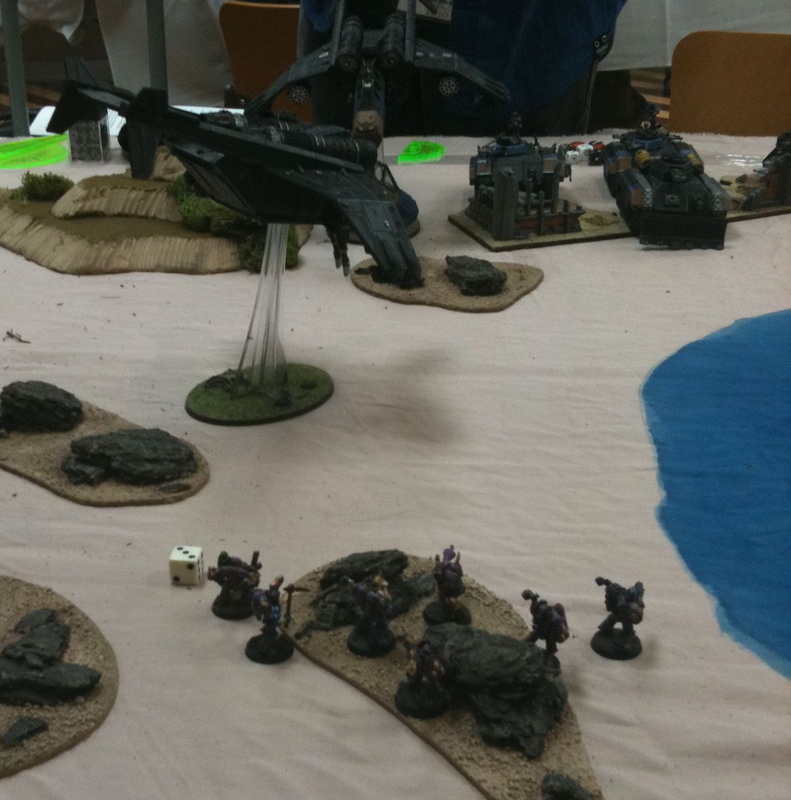 George had already run off but was cut off by the scarab swarms so he pasted ’em. 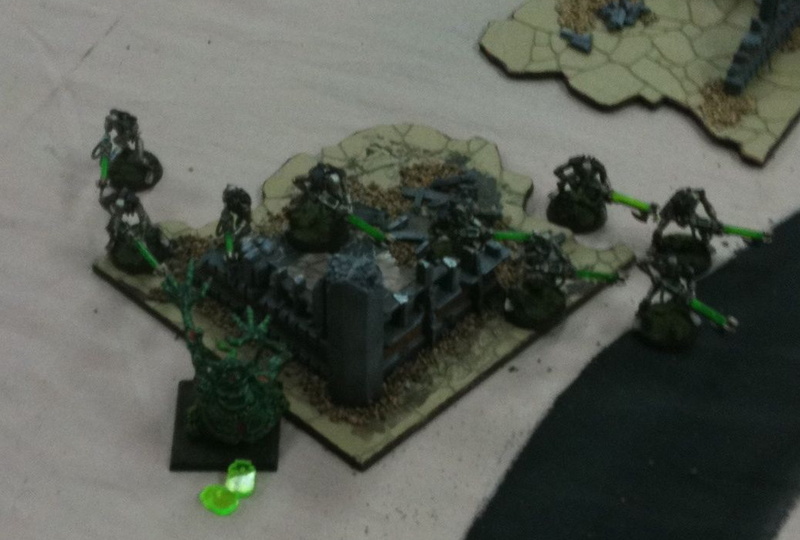 The actual Necrons kept moving around in difficult terrain undecided whether they wanted to advance and shoot or run and hide. Eventually they blasted George to death when he was about an inch away from them. I also sent my last living Plaguemarine towards the Necrons. Although George failed to reach the Necrons the last Plaguemarine did, he killed one with melta gun then killed another with his bare hands. I made my armor and feel no pain saves. So the Necron player lost combat by one, he broke and the superior Plaguemarine Initiative enabled me to run him down. That is right one Plaguemarine killed 12 Necrons in a single turn. The way to beat Necrons is definitely to get into H2H with the regular robots. The Pyramid backed up making room for lots of shots to hit my surviving three models, then the C’Tan charged the last survivor and the game was over. I scored zero tournament points. That is right I went from doing the best possible to the worst possible in back to back games. I didn’t suddenly become an idiot during the 30 minute break so it shows you just how much matchups and missions matter, not to mention terrain. Paying attention ‘Ard Boyz aficionados down South? I was a bit unlucky not to kill the Pyramid perhaps I had 15 chainfist attacks several lascannons and two meltaguns… Oh well next year. I’ve already got two army lists to work towards but my main goal is to work on the trench table. I don’t mind entering an army consisting of whatever I have painted in my display case at the time, but I’d like to paint my Servants of Decay army or at least a few new options for my Chaos Space Marines. 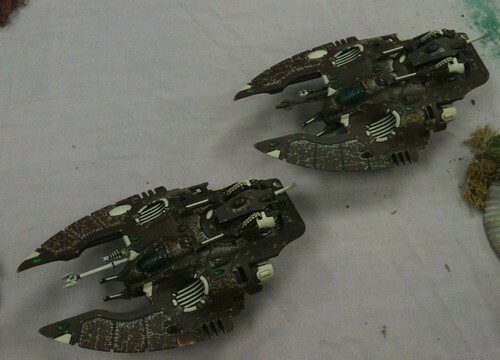 I actually have four vehicle models to paint as I won a Forgeworld Khorne model, this was forgotten in Winnipeg, but was a very desired door prize. I only had four or five tickets in the bag, others may have had twenty or more. Some people spend a lot of money buying extra tickets to try and win some of the better donated door prizes. 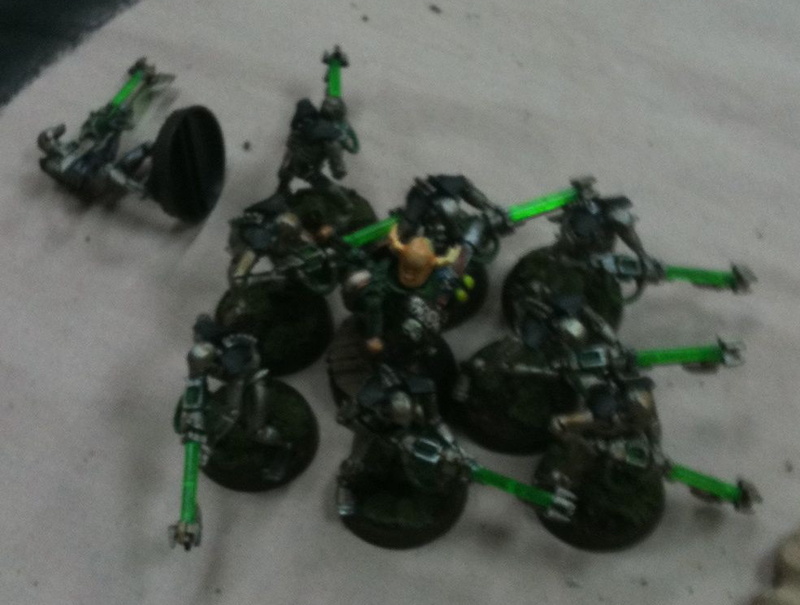 My new target CSM army list includes Bezererkers as I need them in order to field my new Blood Slaughter. We’ll see just how much painting I can get done over the course of the next year or so. I badly need a job and still am in a running for a few, so hopefully my job search is finally at an end. Damn you’re quick, I’m still fixing all the grammatical mistakes and typos. I’m not really bitter I think you were really smart to stick with Imperial Guard this year and you totally devoted yourself to improving your painting score. You practiced a lot with that army and you’re an Astro vet now so you know some of what to expect. I’m ignorant of some of what is called what. I’ll fix it. Thanks for reading. I too try to win with non-cheesey lists and I definitely don’t use any special characters, though maybe I shouldn’t handicap myself so much anymore as I rarely play. I did see the smileys and I knew you and I were just having a bit of fun online, but I’m trying to be more careful online with what I say in hobby circles, never know who might take offense to me call them say an army hopping, cheddar monkey. What does that even mean? If you pay close attention to my massively long summary I actually did very well against the Imperial Guard overall, and based on it’s popularity it is probably the best overall codex, because you can roll a lot of dice, generally in the shooting phase, generally well over Strength 4. Your guard army, which was the only one that didn’t have a special character, Ryan had Colonel Straken and Devon had Marbo and Sargent Barsonne I believe, was the one I lost too. I beat the others, if I had more turns I would have tabled Devon perhaps, but that isn’t my style. I took out his main quarter, defended mine, and scrambled at the end to contest one more for the win. It’ll be much harder for you to win next year. For instance my Sorcerer who joined a unit of Plaguemarines actually became Fearless himself, of course with my luck I would have still died in H2H to the Ogryns. Or even if I won the Leman Russes or the flyers that aren’t flyers would have shot down whatever survived H2H. People will be trying harder to beat you I imagine, well those that know you’re the defending champion. I really like the ideas I have for next year, they aren’t overwhelmingly obviously awesome, but hopefully they look cool and are fun to play against on the table top. I kinda wanna see the spreadsheet this year, I did get my highest appearance score, I checked for you last night. Though in 2008 I got a higher score for Conversions and Brushwork, the display base and not doing/bringing models that annoy Christian or Mike helped. See I learn new tricks or I’m smart enough not to make the same mistake at least. I’ll have to see where I can try to improve my overall score. I think with a slightly more competitive list, ie not 20 comp, I do do better at the actual games. One of my goal lists does earn perfect comp, the Servants of Decay one, the other has three different elite choices as I think that would be cool and might help more than three HQ choices, it’d get 17 or perhaps 16, I don’t really try and game the system. Good luck in Vegas, we’ll be rooting for you.